With its accessible yet contemporary styling, water views and lifestyle-oriented layout, the 2018 winner of the HIA Australian Kitchen Design award has all the ingredients to make life a little sweeter. Part of a luxury warehouse conversion, this award-winning kitchen fuses the building’s industrial aesthetic with a sophisticated edge. I found out more from the project’s designer/builder, Art of Kitchens. Hamptons style homes are in demand right now. This style of architecture – think horizontal cladding and crisp white timber accents – is highly suited to the Aussie lifestyle. 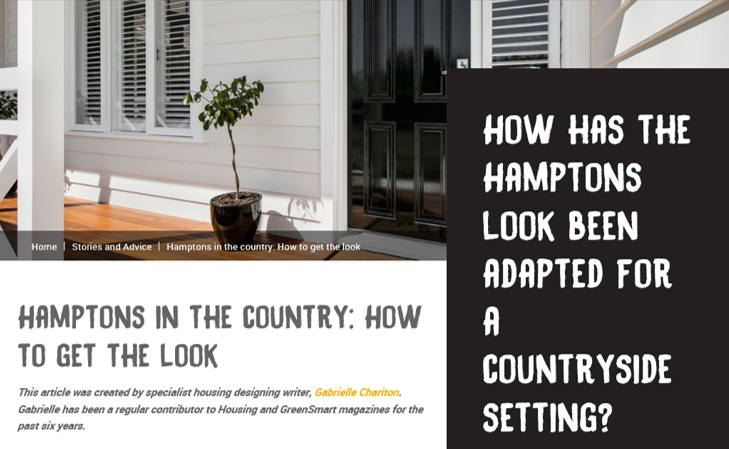 In this piece I share a few tips on how to adapt the Hamptons look to a rural setting. Technology and lifestyle are the key drivers behind the newest trends in kitchens and bathrooms. This spec home was built by Eco Essence Homes to demonstrate how maximum energy efficiency can be achieved at a realistic budget. The result? A universally appealing, highly liveable, award-winning home. Profile of award-winning interior designer Di Henshall, whose unerring style and innovative ideas are making waves both in Australia and abroad.